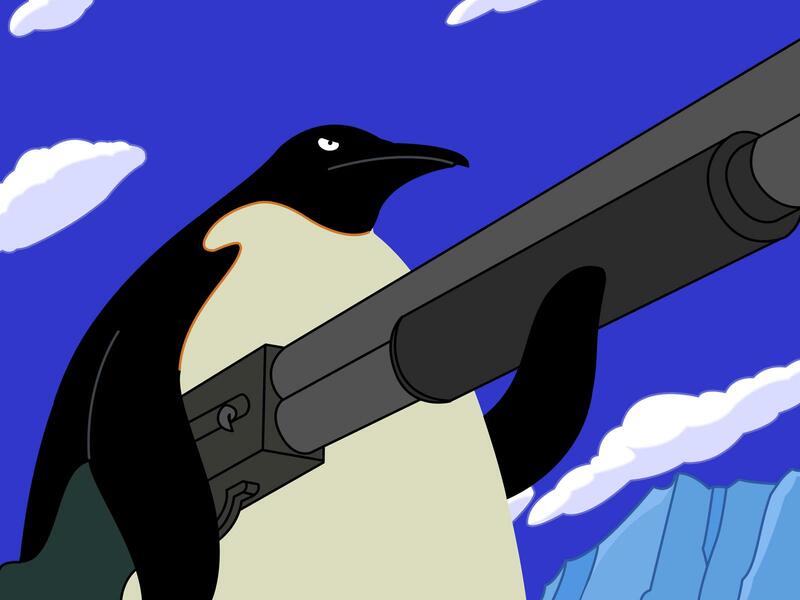 Militant pengi might make you think that I’m unhappy, but quite the contrary – I just love this image. That aside, I’ve been paying close attention to where I live these days, a bit more than usual. Aside from some of the lovely things I’ve noticed already, like the brilliant view of the trees and the leaves outside of my windows (which are starting to turn fall colors and look beautiful) and the rabbits scurrying about the brush behind my apartment building, the people sometimes make for more interesting observation. For example, my geek neighbor in the basement who I saw walking inside with a shiny new computer case. I didn’t think much of it until I saw him again wearing an XPS t-shirt (as in, Dell’s XPS high-end computer line) and noted that he’s driving a pretty beat up mustang with stickers on the rear bumper that give him away completely. One of them is the same as t-shirt I used to have and has an NES controller on it with the words under it proclaiming “Know Your Roots,” and another on the other side of the bumper that says “I’m not a geek” in large print, and in small, “I’m a level 12 paladin.” I like him, and given that he smiled at me the last time I got into my car (my own license plate says “ph34r”), I think he likes me too. Aside from my geek friend, there’s an older couple who lives on the ground floor right in front of where I usually park. They have a huge – and I mean HUGE, probably 65-inches – HDTV that’s facing the glass sliding foor that leads out of their apartment and onto their porch, which is a few feet from the parking lot. When I pull in from work at the afternoon they’re usually watching the news or something else interesting with the blinds open so they get some light and can see the world go by. When I’m leaving late or drop in to the apartment in the middle of the day, the lady of the house is usually out on the porch tending to the myriad of flowers and other plants that decorate her porch and essentially half of the lawn leading from the apartment to the parking lot. The couple is incredibly kind and sweet, and always encouraging – the last time I passed her on the way out for the day she told me to “go hit em!” since it was clear I was on my way to the office. Just above that couple is a family of some middle-eastern decent – one of whom actually werks where I werk, just in a different unit. They’re always cooking something that smells delicious, the children are always boisterous and happy, and if I’m leaving at just the right time of day I’m treated the the beautiful sound of the morning call to prayer singing through their apartment and filtering out through their door. I’m not of their faith, but I have to say the morning and evening calls to prayer are melodic and beautiful to listen to. Above them and diagonally across the landing from me are probably the people closest to my age in the building. I don’t know them very well, although the youngest lady in the unit (and probably closest to my age) paused one day to welcome me to the neighborhood at the front door and introduce herself. She told me if I needed anything to let her know, and I saw her a while later and she remembered my name and said it without hesitation. She’s confident, clearly, but it shocked me because I’m ashamed to say that I forgot hers. I dig this place, and it doesn’t hurt that I live right across from one of the best Afghan places in the area, a half-dozen pizza and sub places deliver here, and I’m also across the street from a grocery store. Which doesn’t necessarily mean that I’m any better at getting there when I’m out of something – I’ve been all but out of shaving cream for the past week and every day I neglect to stop by and get more. I was using the all aerosol, soapy liquid in the bottom of the can for a couple of days now – thankfully I went to the store this evening and picked up a few things. The weekend’s datacenter move went well and I got my Saturday back when I wasn’t really expecting it – I just slept in good and long, and I feel much better even though my dreams were horribly apocalyptic. At least now I know what I would do if I were at the office and heard the news that our world was about to end. There’d be some well placed phone calls to let people know I love them, and I’d probably wander out to the huge field next to our office building with my cell phone and talk to some loved ones as long as I could until it all came down. Better, I thought, to have my world end while I’m looking at the bright blue sky than to be huddled for comfort inside a pre-fab office building made of glass and steel (with, mind you, no place to seek refuge). I know, it’s kind of depressing to think about, but the moral of the story is that it’s a poignant reminder to me to make sure the people I love know that they are. As my parents used to tell me when I was young: you should never go to bed angry, at yourself or anyone else: make sure your loved ones hear you say you love them – you don’t know if you’ll wake up the next morning.